Great hotel in the city center in Sulmona very quiet and well maintained. And ‘near the central square so it is easy parking but if you want you can get right next to the hotel. Good reception. This hotel is excellent in several ways – great value, central location, superb breakfast and an owner who goes out of his way to be helpful and friendly, with loads of useful advice on the local area. Stay here, you won’t regret it! We were welcomed late in the day…efficient and friendly service, clean and comfortable room and surrounds (I have a bad back so I’m fussy!) Great location opposite an historic church in the old city centre. Fabulous breakfast too! Great city/town to visit, I’d stay longer next time. We stayed only 1 night in Sulmona but had a wonderful time. Roberto was very pleasant & helpful. The accommodations were lovely with a small balcony. Breakfast in the morning was an amazing spread. We would absolutely stay here again & would recommend it to our friends. Everything about our visit has been perfect.the city is delightful. The hotel is well placed,comfortable and welcoming . The breakfast was good.we would recommend it without doubt .there are excellent places to eat a short walk away. Eight years ago we accidentally discovered on a quiet street in Sulmona the Albergo Stella Ristorante and the wonderful brothers, Roberto and Giuseppi, and Mama Domenica. We stopped in for a cappuccino and decided to stay for a couple of nights. The family was extremely helpful with their tips about the area. More importantly, the food and accommodations were just lovely. Some of their special seasonal dinners and desserts would rival the contemporary chefs of today. We were served a baked pear for dessert that we still remember. In November 2013 we had the unexpected opportunity to return to the area. We remembered the Stella, so we stopped in for pranza (lunch). We were greeted by the two brothers with the same great attitudes they had displayed to us years ago. We love how they constantly make improvements to the hotel. Now that we’re living in Rome, we’ve made It our ‘first choice’ hotel, whenever we are in the Sulmona area. Set in a charming little street opposite the town hall and a grand church, this place is pristine and certainly deserves more than the one star rating which is has. The owners who are brothers are really friendly, the rooms are massive and decorated in quite a trendy minimalist way. Breakfast is delicious, with the best cappucinos on tap. Would really recommend it as a central base to explore this beautiful city. I have always stayed at albergo Stella when I am in Sulmona, and I have never been disappointed. It is centrally located, and good value. The breakfast is the best that I have ever come across during my many visits to Italy, and you can rely on the family who run the hotel to give you all the help you need during your visit. This hotel was clean, quiet, and spacious The whole staff was gracious and inviting, especially Roberto and Guiseppe. The breakfasts included were outstanding. The whole town of Sulmona has a very welcoming, inviting vibe to visitors. I hope to return and would stay here again. The location is superb for strolling the downtown area, and walking distance to bus stops for excursions elsewhere. I have stayed in Albergo Stella for the first time in 2008, and again in September 2014. Both times I had a wonderful experience. The hotel is perfectly situated in the centro storico of the beautiful city of Sulmona, well appointed and the staff are amazingly friendly and helpful. Accommodation is comfortable and of high quality and breakfast is something to look forward to every morning. 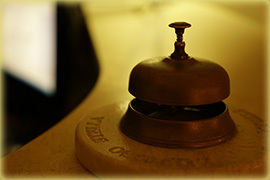 Management and staff gladly go the extra mile to ensure the comfort and enjoyable stay of their guests. I can gladly reccommend Albergo Stella to anyone visiting Sulmona, one of the most amazing cities in Italy.